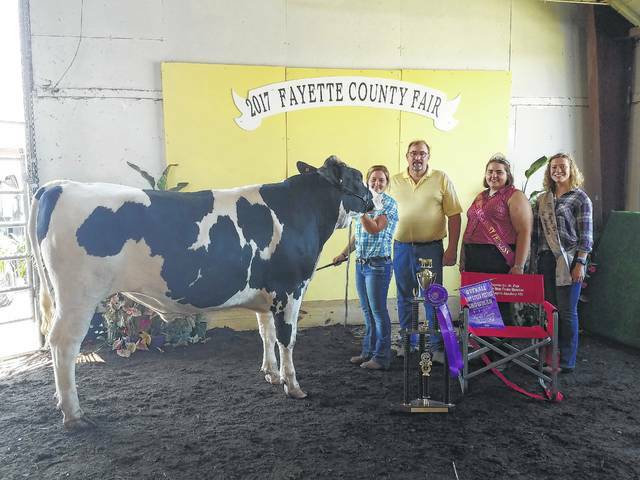 Abigail Riley won the Reserve Champion Dairy Steer prize Wednesday. Riley is also the 2017 Small Animal Queen. 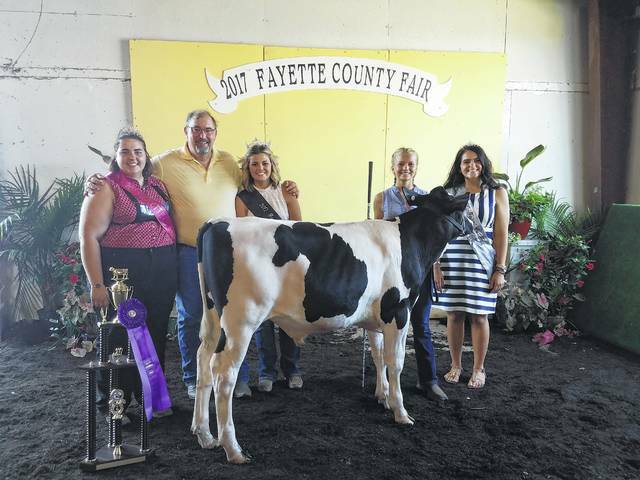 Anita Pursell won the Grand Champion Dairy Feeder prize Wednesday during the 2017 Fayette County Junior Fair Dairy Show at the sales arena. She is pictured with 2017 Dairy Princess Chloe Lambert, judge for the show Jeff Fisher, Fayette County Fair Queen Marissa Sheets, and Queen Attendant Susanna Eckstein. Michael Schappacher won the Reserve Champion Dairy Feeder prize. He is pictured with 2017 Dairy Princess Chloe Lambert, judge for the show Jeff Fisher, Fayette County Fair Queen Marissa Sheets, and Queen Attendant Susanna Eckstein. Victoria Schappacher was named the Overall Dairy Feeder Showman. She is pictured with Queen Attendants Susanna Eckstein and Clare Sollars and 2017 Dairy Prince Chloe Lambert. Victoria Schappacher won the Grand Champion Dairy Steer prize and was named the Overall Dairy Steer Showman. She is pictured with judge for the event Jeff Fisher, 2017 Dairy Princess Chloe Lambert and Queen Attendant Clare Sollars. 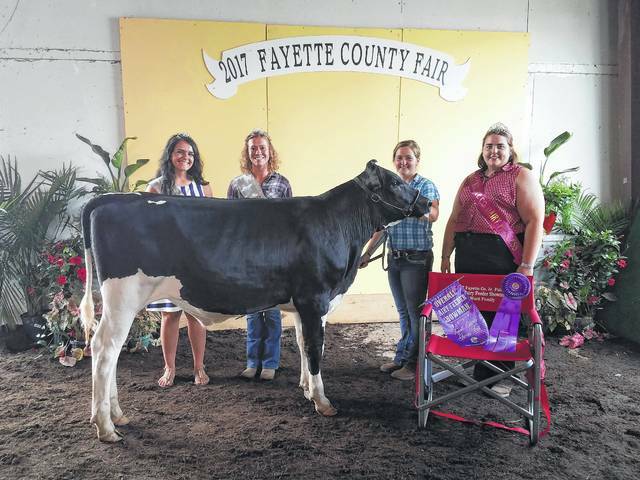 The 2017 Fayette County Junior Fair Dairy Show was held Wednesday at the sales arena with Anita Pursell and Victoria Schappacher taking the top prizes. The dairy competitions began at 11 a.m. Wednesday with seven dairy feeder classes. The competition was as hot as the day as exhibitors attempted to claim the grand champion position. Jeff Fisher judged the event and decided to award Anita Pursell’s project Grand Champion Dairy Feeder. Fisher said that he chose Pursell’s dairy feeder because it was one of the most structurally correct calves that he saw in the ring. He said think about what is in a steak: bone, meat and fat. Once the animal has the right bone structure, Fisher said an exhibitor can build the right muscle on their animal. Fisher also said that Pursell’s calf had a really nice long level top, which is where they get high value steaks. Michael Schappacher won the reserve champion dairy feeder prize Wednesday and Victoria Schappacher was named the Overall Dairy Feeder Showman. After a brief break, the dairy steer projects competed between four classes to determine a Grand Champion Dairy Steer. Victoria Schappacher once again claimed another victory as she not only won the Grand Champion Dairy Steer prize, but also solidified her position in Saturday’s Showman of Showmen competition by being named the Overall Dairy Steer Showman. https://www.recordherald.com/wp-content/uploads/sites/27/2017/07/web1_20170719_143838.jpgAbigail Riley won the Reserve Champion Dairy Steer prize Wednesday. Riley is also the 2017 Small Animal Queen. 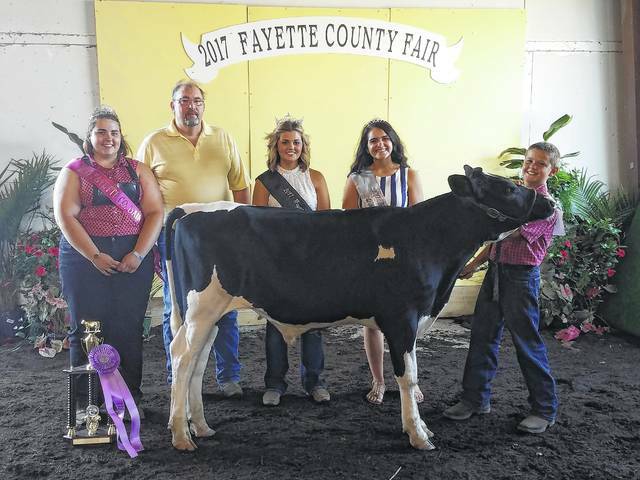 https://www.recordherald.com/wp-content/uploads/sites/27/2017/07/web1_20170719_123244.jpgAnita Pursell won the Grand Champion Dairy Feeder prize Wednesday during the 2017 Fayette County Junior Fair Dairy Show at the sales arena. She is pictured with 2017 Dairy Princess Chloe Lambert, judge for the show Jeff Fisher, Fayette County Fair Queen Marissa Sheets, and Queen Attendant Susanna Eckstein. https://www.recordherald.com/wp-content/uploads/sites/27/2017/07/web1_20170719_123409.jpgMichael Schappacher won the Reserve Champion Dairy Feeder prize. He is pictured with 2017 Dairy Princess Chloe Lambert, judge for the show Jeff Fisher, Fayette County Fair Queen Marissa Sheets, and Queen Attendant Susanna Eckstein. 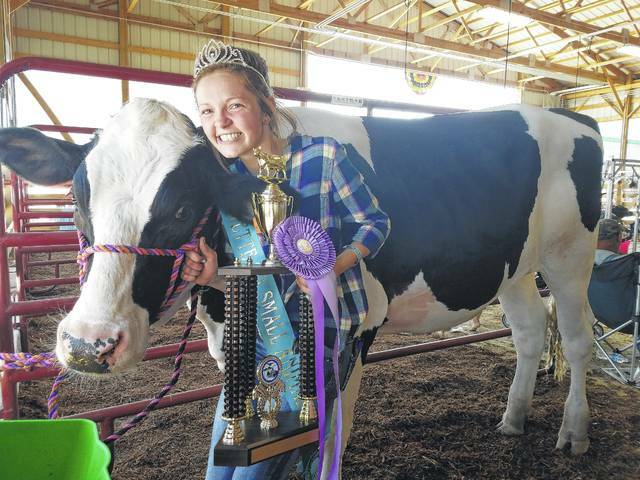 https://www.recordherald.com/wp-content/uploads/sites/27/2017/07/web1_20170719_133726.jpgVictoria Schappacher was named the Overall Dairy Feeder Showman. She is pictured with Queen Attendants Susanna Eckstein and Clare Sollars and 2017 Dairy Prince Chloe Lambert. https://www.recordherald.com/wp-content/uploads/sites/27/2017/07/web1_20170719_143410.jpgVictoria Schappacher won the Grand Champion Dairy Steer prize and was named the Overall Dairy Steer Showman. She is pictured with judge for the event Jeff Fisher, 2017 Dairy Princess Chloe Lambert and Queen Attendant Clare Sollars.